One hundred and one years ago, on April 9, 1917, the 2nd Canadian Mounted Rifles battalion (made up mostly of Victoria, B.C. soldiers) joined tens of thousands of other Canadian troops who bravely stormed Hill 145, Vimy Ridge, in the World War I battle that changed the course of history. Over four days, the Canadians, along with the British 5th Division and many artillery units, overwhelmed the Germans and took the ridge. A regiment historian of the 2nd CMR recorded that at 5:30 AM on Easter Monday (April 9) the troops began the assault along the 6.5 KM ridge. Troops trudged through thick mud churned up from explosions, the ground beyond recognition being littered with wire, bodies, artillery, etc., the stretcher-bearers close on their heels. Guns were jammed with mud from soldiers lying on the ground, the Germans firing on them at point-blank range when they met in the trenches. The 2nd CMR Battalion attacked with five officers and 664 other ranks. Upon relief on April 12, 14 officers and 335 other ranks remained, the rest wounded or killed. Despite these horrendous conditions, on April 9, during the height of battle, this group managed to capture five war trophies. Included in these trophies were one field gun, three machine guns and one trench mortar. These and many other trophies were brought back to Canada as symbols of victory. The Canadian government then distributed the trophies to communities across Canada. 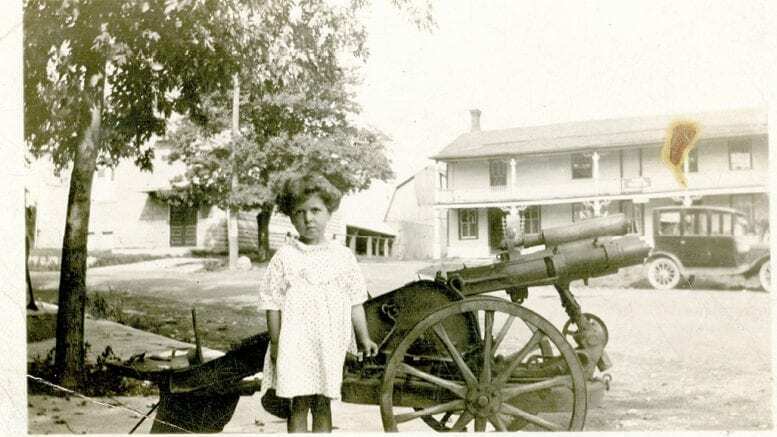 It is the trench mortar, captured on April 9th, 1917, by the 2nd CMR Battalion at the battle of Vimy Ridge that is pictured in the photo above, in front of the Temperanceville Inn (much later Keith’s) in Fonthill, dating from the late 1920s. The mortar arrived in Fonthill on October 26, 1920 via the Grand Trunk Railway. A machine gun captured at a different location also arrived in Fonthill on this day. There are no specific references made in archived Town Council minutes regarding a war trophy being placed in Fonthill, though on December 15, 1920, the Council minutes show that permission was sought to place field guns at Old Town Hall. The fate of the Fonthill war trophy remains a mystery. Most likely it was sent back into scrap at the beginning of World War II, when three-quarters of Canada’s war trophy guns were melted down for scrap metal as the war machine ramped-up once again. The Pelham Historical Society would appreciate the opportunity to scan and archive any resources you may have. Editor’s Note: The Pelham Historical Society will present a talk on Vimy Ridge this coming Saturday, starting at 2:30 PM, at Kirk-on-the-Hill in Fonthill. All are welcome.